Reddish orange color. Some particle suspension. Citrus hops with sweet malt background. Frothy white head with strings for lacing. Big hops presence in taste without overpowering. Very easy drinker, but be careful of the high ABV. Medium to heavy bodied. Tremendous balance. Meeting new friends can be so much fun. Our host Mark, the mastermind of Mr. Beery's, treated us this evening to a sample of his private stock from Tröegs Brewery. This is the reason, dear readers, that you should pursue your adventures in craft beer. 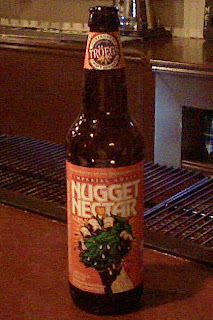 The payoff in friends along with little gems of beer, such as this Nugget Nectar, is worth the pursuit. This ale is incredible. It has a beautiful copper bodied color with 7.5% ABV to tantalize. There are 93 IBU's of hops for us hops freaks. Despite the 'hops grenade" on the label, you will get the pine/citrus hops notes on the nose, but amazingly they will not overpower the taste. Superb balance of ingredients yields an excellent brew. One whiff and one sip is all it will take to convince you that those boys in PA got their brewing stuff down pat. Oh, it helps to share over a discussion about who crafts these beverages. Once again, the formula for success is to seek out friend opportunities through you beer experiences. That is the best way to bring out your true inner beer geek. Being a PA boy myself, I am very sad that I've never been to this brewery and never had this beer. You see, I am stuck in Florida now! A friend of mine did bring home a Troegenator from a business trip last year. It was a six pack until he drank five the night before leaving. I am from the Northeast originally and now live in FL, like you. Fortunately, the bar-keep at this fine new establishment was kind enough to share his private stock. Make your 'someday' soon and you will be rewarded! Cheers and thanks for posting!